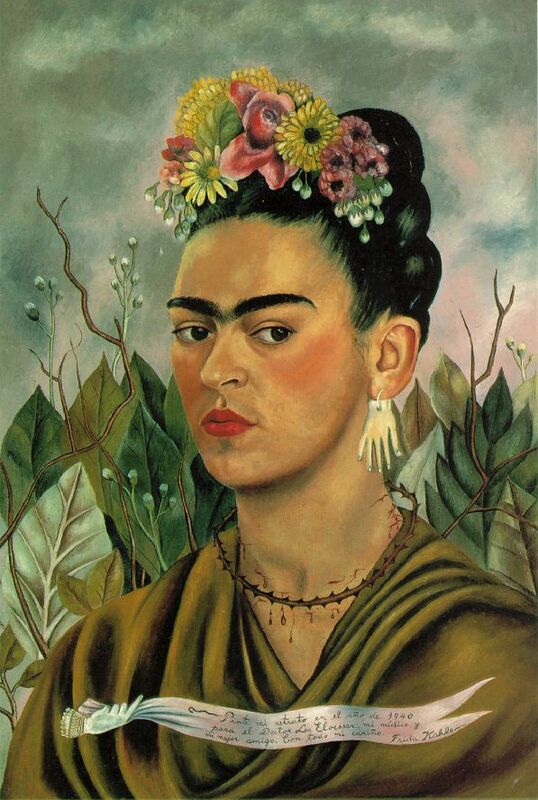 Frida was a lady who really lived. She was not dull in anything she did. I love that she was so fearless in her paintings and in life. (This is how she inspires me.) The images and themes in many of her paintings were intense and not what most other artists of her day were doing. She really followed her own desires and stayed true to them. She was not trying to impress any people or any movement, she did not follow what others did to try to fit in. She went her own way. Some thought that she was a surrealist, a popular movement at the time. Really, she didn’t identify with this either. She couldn’t be put into a category as far as her style went. Perhaps, she was her own movement. I’m sure her extremes both helped and hindered her fame. But certainly, it is why she is so well known and remembered. It’s funny how during her life, her husband Diego Rivera was the famous artist and she was in his shadow and seeking to be more known. They have both long passed now and it’s she who is more commonly talked about. Diego, not as much, apart from her. I wonder what she would say about that. ― Frida’s last diary entry.